Broccoli is one of vegetable that is most beneficial for health because it contains complete nutrition. Broccoli nutrition such as potassium, has benefits to help keep our nerves system working properly. The biggest broccoli health benefits is to help prevent cancer, even there are still many benefits that we can get from it. By the way, do you know how many calories in broccoli ? Because, broccoli is one of low calories vegetables in the world. In every 100g broccoli contain only 31 calories. Broccoli contains a variety of beneficial minerals including iron, calcium, and potassium. For people who do not consume milk, broccoli provides about 4 percent of calcium recommended daily requirement. Broccoli also contains vitamins A and C, as we know that Vitamin C helps the immune system to stay strong and healthy. For more information you can read broccoli nutrition facts below. Research conducted the Royal Pharmaceutical Society in the UK proves that among other vegetables, broccoli has most powerful anti-acetylcholinesterase. The ability of broccoli inhibit brain damage caused by the enzyme acetylcholinesterase is even very similar to the efficacy of drugs given to people with Alzheimer's. With notes, broccoli was not cooked too long, so that the nutrients in it are still intact. The highest broccoli nutrition is vitamin C, that meet 149% from our daily needs in every 100gr. There are also several amounts of minerals such as calcium, copper, iron, magnesium etc. Broccoli also good source of vitamin K, in every 100 gr of fresh broccoli, contain 101.6 µg of vitamin K. This mean, it's meets the daily requirement by 85%. Below you can read broccoli (Brassica oleracea var. italica) nutritional value per 100 gr servings according to USDA Nutrients database. Helps prevent cancer. One of the biggest broccoli health benefits is the ability to fights disease. Many experts claim that broccoli really able to detoxify the body and is known to have preventive properties against breast, bladder, colon, and ovarian cancer. Because the content of indoles and isothiocyanates, phytochemicals in broccoli. Preventing heart disease. Researchers at the Institute for Food Research in Norwich, England, crossing two different types of broccoli to develop super broccoli glucoraphanin containing up to 2 to 3 times the normal amount. Nutrients are believed to help prevent heart disease. Improving immunity. The author of 'Eat Your Way to Happiness', Elizabeth Somer, RD, says that broccoli contains high levels of vitamin C, which can boost the immune system and help fight infection. In addition, broccoli consists of phytonutrients and phytochemicals, including sulforaphane, which helps remove toxins from the body and strengthen the physical endurance of the flu. Controlling blood pressure. Broccoli may help maintain a healthy nervous system and balance the effects of sodium on blood pressure. In addition, the potassium content can help stabilize blood pressure and nervous system and maintain healthy brain function. Preventing cardiovascular disease. Several studies have shown that vitamin B6 and folate contained in broccoli offer some protection against heart disease and stroke. Improving digestive health. High fiber content in broccoli can prevent constipation by launching the gastrointestinal tract. Helps fight depression. Folate deficiency, are prone to develop depression, fatigue, poor memory, and mental problems like schizophrenia may be more serious. You can fight sadness by increasing the consumption of vegetables such as broccoli. Improve bone health. Broccoli contains calcium and vitamin K, both of which are essential for bone health and to prevent osteoporosis. Making vision sharper and repair skin damage. Broccoli contains lutein and vitamin A is essential for eye health. Research has shown that high levels of lutein may prevent age-related degeneration of the eye such as macular and cataracts. Broccoli also contains glucoraphanin, which can help repair skin damage caused by sun exposure or the aging process. Helps weight loss. Non-carbohydrate vegetables such as broccoli can be a healthy food choice that can support your diet. High fiber content, making the digestive system takes a long time to digest so you will feel full longer. The best way to cook broccoli is steamed, it is intended that all important vitamins and nutrients is not lost during the cooking process. 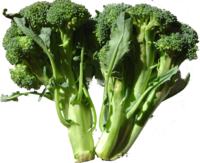 Boil broccoli will eliminate about 50% of folic acid contained. Therefore, if you want to process broccoli with boiled it, do not be boiled too long, approximately no more than 5 minutes.